It's a funny thing when you start collecting - you either find yourself buying things really fast so you'll have an instant collection to enjoy OR you take your time because the thrill of the hunt is often more satisfying than admiring a sought after collection. Depending on the collection I find myself doing a little bit of both. 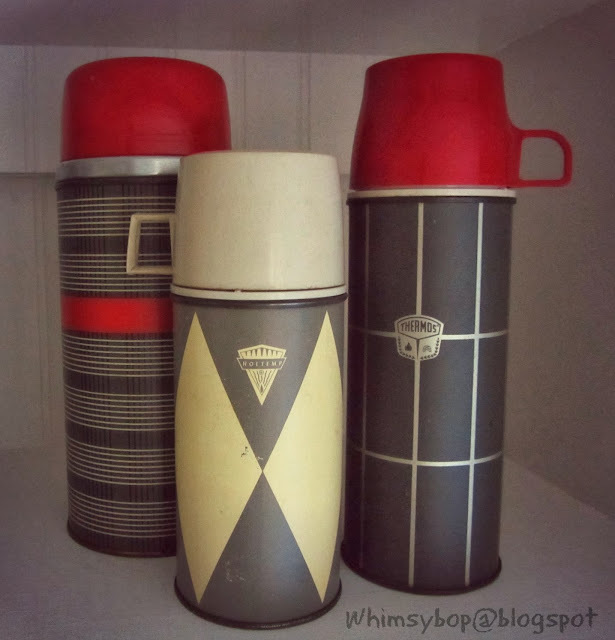 My collection of Thermos bottles was one such collection I couldn't resist, nor could I rest until I had a shelf full of them! 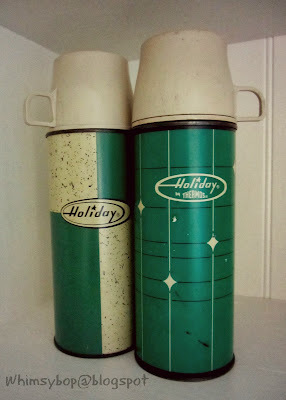 I'm not sure when the thought hit me to collect thermos bottles - I'm pretty sure it was on a visit to my folks' place in South Carolina. Whenever we made a family trip to the southland I'd try to hit every thrift shop in the area in the first few days of our visit, then I'd hit them all again a day or two before leaving town. 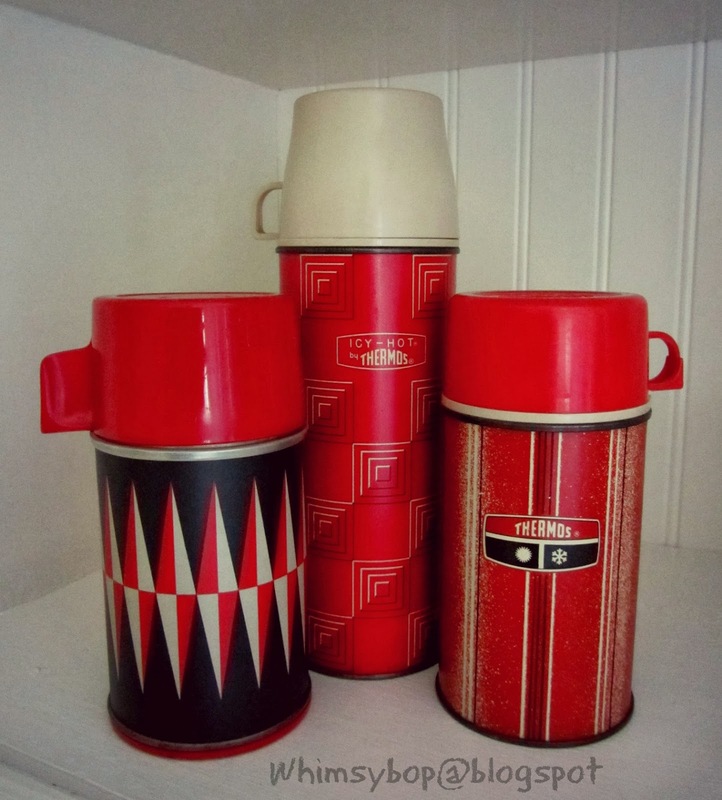 During one such trip I noticed an abundance of Thermos bottles of various sizes, colors and designs in the kitchenware section. Seeing them grouped together on a shelf from a distance made me come in for a closer look. 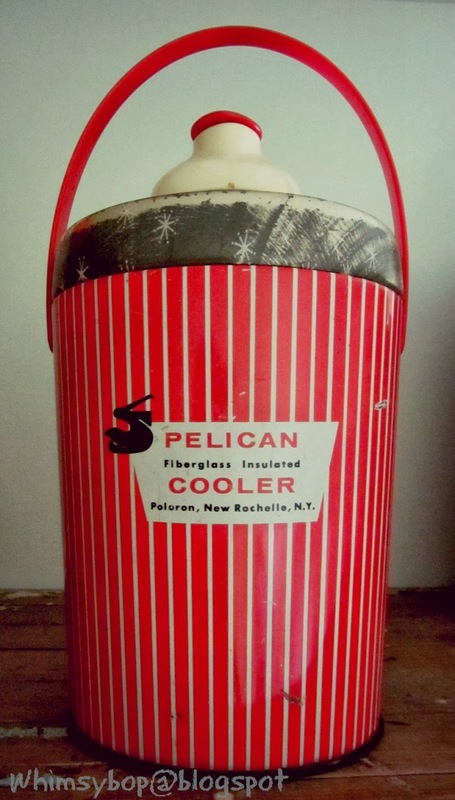 When I flipped each Thermos upside down to read the price written with black wax pencil, I knew that at fifty cents each I had the beginnings of a fast and furious collection. 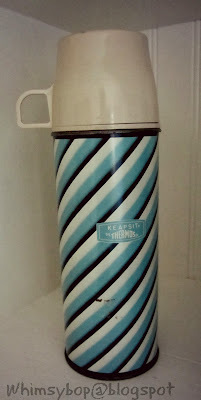 I quickly made the decision to be somewhat picky since I didn't need to own every Thermos bottle known to man. I chose to buy only the metal bottles that were in good condition and contained all their original parts (stopper and cup). I bought about eight of them at my first stop and let me tell you, as I made the thrift shop circuit - I was on a roll and doing the happy dance along the way! After my thrift shop frenzy was over that day, I had over a dozen Thermos bottles to show off to my husband and my parents who all looked at me as if I grew a third eyeball while I was gone. 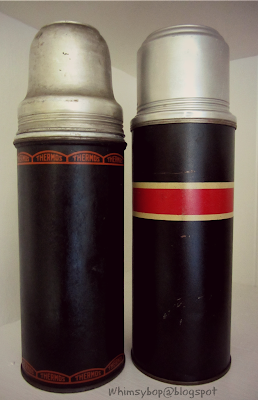 My young children, however, were very curious about my purchases since they had never seen a Thermos bottle before. They were enamored with them as well, but purely for the utilitarian purpose that they could now take cold lemonade and chocolate milk everywhere they went. By the time we left for home I had enough Thermos bottles to prove to the world I was a serious collector! My collection is still growing but it has slowed down considerably (mainly because I don't need repeats and I only have so much space for showing them off). 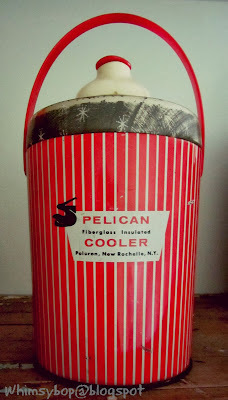 I probably have around fifty or so, not including a few old coolers that I also find very fascinating - and very Americana! Now that I have more than my share, I tend to look but don't buy - unless of course I find one I don't have yet AND if the price is right. I can still find them fairly cheap at yard sales, thrift shops and some flea markets, (usually under $5). The price gets steeper when you go to antique shops or online auctions and like most vintage items, expect to pay more for mint condition and the rareness of the bottle (about $10 - $50). 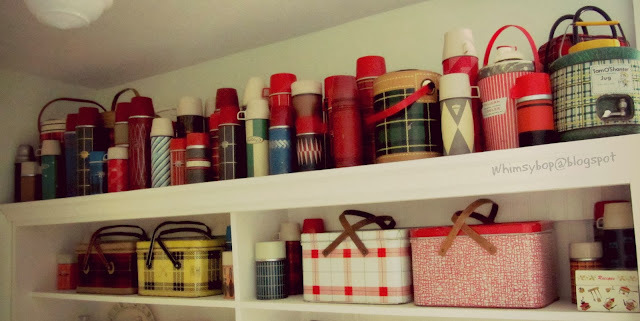 When my husband built our laundry room, he carefully measured each shelf in order to adequately display each Thermos bottle in my collection. Unfortunately, we didn't take the humidity of a laundry room into account, which could have eventually caused my treasure trove to rust (bummer). I am happy to report the Thermos bottles have been relocated and are now perched high and dry in our newly renovated butler's pantry (thanks honey!). Make sure to display your Thermos bottle collection in a room with little or no humidity and also keep them from direct sunlight to prevent the colors from fading. I started collecting thermoses around January '14, when I first started doing estate sales for a friend that eventually grew into it's own hobby/business. Every house seems to have at least one, so my collection has grown into quite an interesting lot because I have so many different thermoses, some old, some new. 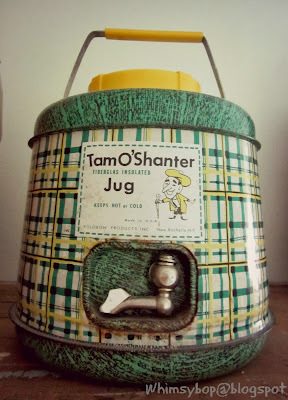 I know what convinced me to take home my first plaid picnic jug... ever since I was young, I always loved the movie 'The Jerk' starring Steve Martin. It was and still is one of my favorite movies of all time, and the opening of the movie is touching, the part where Steve's character Nevin says: 'I'm not a bum, I'm a jerk... I once had wealth, power, and the love of a beautiful woman... now I only have two things: my friends... and... uh... my thermos!' I think that's what really got me into collecting these, so heartwarming, these little vaccuum bottle beverage holders. Hi Patti, I'm so glad you found my blog! 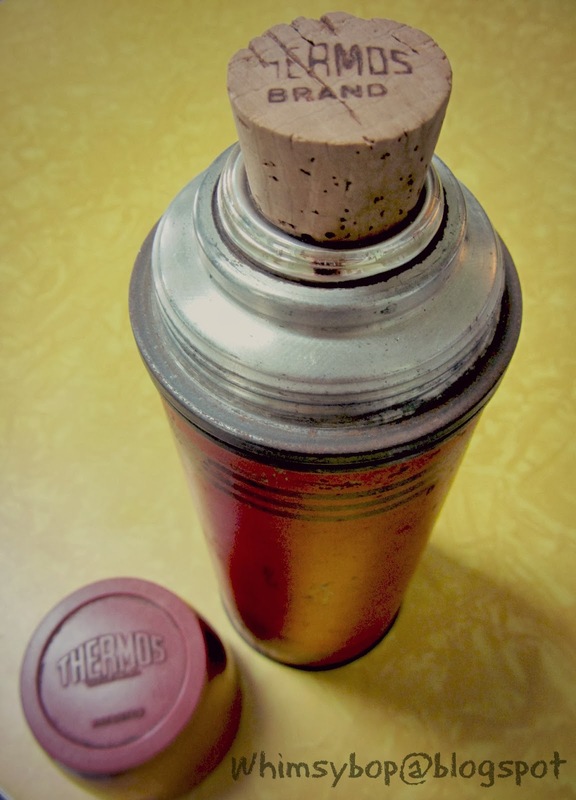 It sounds like you have something of value to folks like me who collect old thermos bottles and sometimes have to buy them without a liner inside. If you sell on e-bay or on Etsy (or any similar venue), you can post them there or if you live in an area where there is an antique shop you can ask if they would be interested in buying them from you or allow you to consign them. If you just want to get rid of them but want to save them from the landfill, you can sell them at your next yard sale/estate/tag sale or even donate them to a thrift shop - collectors like me love to treasure hunt at yard sales & thrift shops first! Be aware that you may not get the price your looking for by selling it on your own (people LOVE to haggle as they expect a deal at a yard sale). If taking the yard sale/estate sale route I recommend pricing them individually but offering a discount if the entire lot is purchased. As far as I know, glass replacement bottles are out of production (plastic and metal are now the material of choice because of their durability) so you really do have a treasure. Also know that the small half pint size replacements (for kid's lunch box thermos) demand a higher price tag since vintage lunch boxes are HOT and difficult to find glass to fit. I hope this helps Patti and I wish you the best of luck! What to do with an old utensil tray?